White Elfa Mesh Start-A-Stack is rated 4.9 out of 5 by 134. The assembled weight of our elfa Mesh Start-A-Stack is 20.9 pounds. 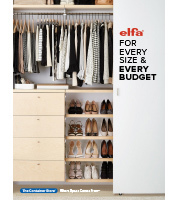 What is the difference between the white mesh Elfa Start-a-Stack drawers and the medium white mesh closet drawers besides the top on closet drawers? Are both sets already put together? 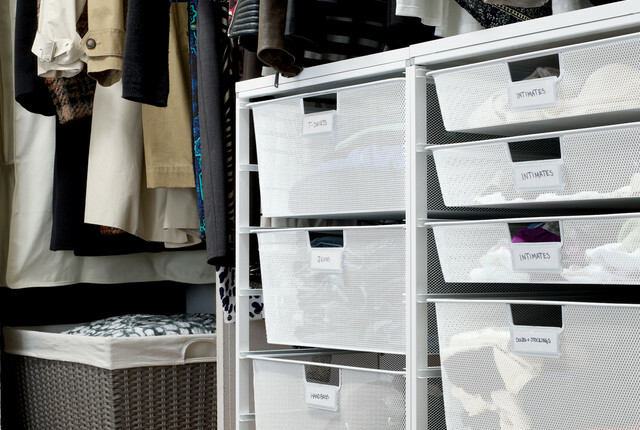 The White elfa Mesh Closet Drawers includes a top and frame feet, while the Start-A-Stack does not. Don't we all have something we're holding onto in our closet that we really just need to say goodbye to? Maybe it's those favorite jeans from college or that dress that you love and just know is going to come back in style. For Laurie, it was a pair of painter's pants that she had from her teenage years in the late 70s - something she hadn't worn in years but that evoked fond memories of her youth.